Why Is Food and Drink Prohibited At The Nurse's Station? While you state that beverages at the nursing station might have a lid or cover, the container may also become contaminated, resulting in unsuspected contamination of the hands. Oh yes, the life threatening contamination of my hands from cross contaminated beverage lid syndrome. Thank goodness we have OSHA to protect us. Clearly, this is not a patient safety issue, but rather an employee safety issue, which is why OSHA is perfectly OK if you leave the room of a patient with c diff and head to lunch to chow down on some greasy fries without washing your hands. The Joint Commission has no specific standard on the issue other than for hospitals to comply with OSHA regulations. Dr. Happy has found a way around this madness by carrying around a doctor's prescription with him. Can a hospital employee have a doctors note for water and avoid the hospital being dinged by The Joint Commission? I ask because I am a heart patient and on several meds that can cause dizziness and often do. I also take two diuretics daily. I was told no, but I saw a list of drink infractions and a site was listed and had the following note "two drinks in registration area, one belonged to employee with doctors note and the other employee was out of compliance." What about the specific issue of drinking coffee at the nurses station? It's the same story. They aren't worried that you'll spill coffee all over your computer. They aren't worried that you'll infect all your patients with a deadly bacteria. If they were we wouldn't have the dirtiest place in a hospital being the coffee machines. The no food or drink rule is driven to protect employees from ingesting life threatening MRSA nursing germs that have contaminated, forever, the air space of the nurses station. Don't leave your coffee cup unattended or the coffee police will swoop in and confiscate your contraband. We need those folks in Afghanistan. They always seem to know where the enemy coffee stockpile is being stored. So Happy is left with no solution but to take his coffee medication with him from room to room. Don't worry though, he usually puts a squirt or two of alcohol sanitizer in the coffee to keep the patients from getting infected and to keep himself from picking up deadly nursing germs. He figures he might as well apply HIPAA regulations to his advantage. He carries around a cup of coffee medication with the word "Medication" written on the side. What's in the cup is privileged information. That's between Happy and his personal physician, who just happens to be Happy. 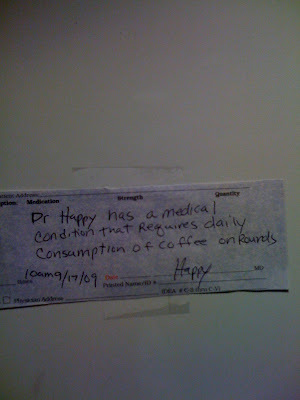 These original Happy hospital ecards below help explain the whole food and drink at the nurses station issues. 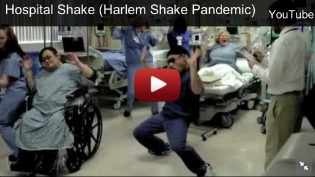 Oh, and this is how one hospitalist group handles Joint Commission days! Until common sense prevails, Happy shall try his best to dodge the coffee police. Sometimes they win. Their stealth actions steal his coffee, never to be found again. Sometimes they try and scare him into submission as they did here below. This doesn't bother him. "So... it turns out... Nurses eat their young because they never get to take their lunch break." "On night shift, our nursing station transforms into the rehydration station. Just so you know." And finally, a story from Gomerblog explaining what life is like on Joint Commission Day. Good humor. This post is for entertainment purposes only. I encourage compliance with all rules and regulations on all days the Joint Commission are in town.